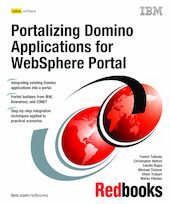 This IBM Redbooks publication describes how to integrate existing Domino applications into the IBM WebSphere Portal. We have coined the term “portalizing” to describe this effort. We begin by explaining why portal integration is so useful for any company that has a Domino environment, and the importance of integrating Domino applications into the WebSphere Portal. We also explain some of the key concepts of portals and Domino application integration, and outline some recognized design patterns for Domino application integration. Next, we preview the recognized integration options which are described in detail later in the book. We also introduce the sample Domino application we used for our portalizing exercises throughout the book. For each of the integration options, we provide an overview of the technology, an introduction to the software and tools used, and step-by-step examples of using the techniques to portalize our sample Domino application. This book is aimed at Domino application developers or anyone else who wants to learn how to portalize Domino applications.